Teaching college has been an energizing event. It’s a nice reminder as the grown-ups have difficulty getting along that there is a great batch of excited, imaginative youth coming up the road – ready to disrupt with gusto. What I’m seeing up close now is the impact new tools have on the ability jump-start ideas. Wasn’t that long ago that the VC’s of Silicon Valley were the enlightened financial doorkeepers to the innovation community. They’re still driving – but new tools are bringing the ability to drive entrepreneurship downstream. Moving from a technical focus to all things business. A few years ago I described Cardboard Theatre, a production my daughter helped initiate. She’s at it again this time using the latest start-up tool on the net – KickStarter. It’s a great pre-order tool – allowing start-ups to get the customers they need before investing in production. It’s a great Creative’s Tool – Many art and theater projects are finding funding through the site. It’s provides ‘patrons’ for performances just getting off the ground. It’s a great social tool – The goal is to raise money for something you would like to see happen. Sometimes there is a deliverable (a product) sometimes a happening, always a thank you. By creating a way for interested parties to invest in an idea – with clear indications about what they can expect if it is accomplished – a whole new world is opened for getting imaginative projects off the ground. Sarah’s latest project is the Stillwaters Street Theater Project (Kickstarter link) – bringing voice to the millennium generation. “A generation shaped by the advent of Myspace, Facebook, blogging, and twitter we [the millennial generation] find ourselves surrounded by a wealth of opportunity to communicate. Suddenly supporting a cause is as easy as hitting a “like” button and just as easy to forget. Where generations before us had to step onto the streets to express their voice ours does it from the safety of a computer keyboard. Our voices merge into the deceptively still waters of our generation. Advanced communication explored through the oldest form of communication where the revolution began. I find it to be an interesting confluence of ideas made possible by an advanced method of funding. Warning – I’m tying together a few loose ends here. Things may get tangled. The application of scientific process to business practice has been one of the critical drivers in the success of modern enterprise. Observe, hypothesize, measure, analyze, apply, repeat. It drives efficiency and progress. Unfortunately things get dicey at the edges. There is an art to being a breakthrough business, in being able to observe the unobservable. Sometimes our ability to envision surpasses our ability to measure. Sometimes you just have to leap. “Leave space for things to come to you,” says Janice Cartier in her discussion of artistic process. In a way, creativity’s feeling of random discovery is a scientific process we have not yet come to terms with. Robin Dickenson commented that for him the creative and scientific processes were modes of thinking that can be switched between. Kay Plantes commented that both the scientific and artistic states-of-mind need to recognize the value each brings to the toolbox of business thought. And then she brought Jeopardy Champ Watson into the discussion. Is Watson imitating human intuition or have programers learned how the old synapses fire. Don’t know. Makes me feel vulnerable though. Understanding and nurturing creative process is a critical competitive advantage, one that the US thought it had pretty much locked up. ‘Sure take our manufacturing jobs, we’ll all be imagineers.’ Now the alarm bells ring for U.S. creativity with a key measure (the Torrance score), falling each year since 1990. “Instead of solving problems, our current mentality is to postpone dealing with them, either by ignoring them or trying to spend our way out of them,” Brad Shorr observed when commenting on the decline. That particular methodology could be seen as a symptom of creative decline in and of itself. Creativity is all about solving, adding, discovering. Maybe a part of the problem is that our ability to measure has suddenly surpassed our ability to absorb. The amount of data flying at the average manager is much higher than ever in history, does it free managers to move or lock them in a narrow pathway? “What if I had been taught that the science of writing is also an expression of art?” Deb Brown asked. We all need to be reminded that some aspect of what we do is art — is creative. No matter how hard we try to bury it. 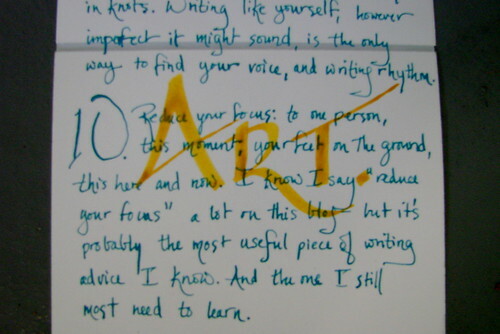 Diane’s question reminded me of this Postcard Project image from Joanna Paterson’s Confident Writing site where she was reminded that “Your Words Are Art.” I like that. More wisdom form Janice, by the way. Learn from the artist. They are closest to the paint. This post has the distinct feeling of a random walk, but sometimes my ideas do come from strange places, so walk with me a moment longer please. If someone beats a drum and says, “Don’t disrupt the production line. You are not creative. You should not be creative. It is not your job to be creative.” Most of us would laugh, and consider the drummer to be silly. As a matter of fact, I’ve never met anyone who would knowingly drum such a beat. But the drummer exists. Self-doubt. Social mores. Wave avoidance. ‘Go with the flow.’ Odd reward structures. Recognize the beat. It’s background noise which we all hum without realizing. Makes you want to cover your ears and run screaming for the woods. Thoreau did. He was on to something. “Imagination is at the heart of great strategy — we need to reconnect with the 9 year old kid living in the back of our head,” commented Bill Welter. I’d say it’s at the heart of a great life as well. I’ve had the pleasure to speak with a number of individuals over the past few months who have brought a deep sense of imagination to solving problems others shy from. Dean Cycon changing the world through coffee, Raphel O Tyson through microfinance in Ghana or Jon Rycek through play. (I owe posts on the later two. Jon just left for Peru to train individuals who plan to build playgrounds for schools in the country as part of Playground Ideas.) They understand the traditional bottom-line, but believe there is something more that a company needs to be measured by. Know anyone who is making a difference bringing social entrepreneurship to life? My students and I would be interested in knowing about them. Let me know in comments or by email. Thanks! Bringing about change is a lot like swimming upstream. Everything and everyone pushes you to run fast with them promising safer, faster, easier waters via alternative compass headings. But changemakers in the world not only swim against the current, they pull thousands upstream with them. Motivating movement with the force of an idea. Guy Kawasaki takes on this force in his latest book Enchantment: The Art of Changing Hearts, Minds, and Actions. I’ve long enjoyed reading Kawasaki for his ability to present ideas that can help you move mountains in ways that are both motivating and realistically grounded. So I was delighted to receive a pre-release copy from his publisher last month to review if I felt so inclined. You have to enjoy a book that wraps up with a chapter on how to avoid being wrongly captivated by individuals who use the Enchantment techniques just outlined against your better interests. Reminds you that in this world of ours there is always someone looking to sway and influence — You are the only gatekeeper who can wholly own the decisions of what is in your own self interest. An important item to remember so that you honestly evaluate the opportunities that come your way as well as avoid becoming cynical about techniques that used honestly can improve your ability to understand, communicate, and motivate. So much better than yawning through a powerpoint deck. I enjoyed the read and can recommend it. It provides ideas and techniques in a comfortable context that makes you feel they can be integrated into what you are doing today. So in the best of worlds, it may just help you change your world and that’s a good thing. Until midnight on the 7th you can get a copy of his previous book Reality Check free with the purchase of Enchantment. Details are here. I just clicked ‘checkout’ for a few pounds of Dean’s Beans. Haven’t tried them before, but wanted to after hearing Dean Cycon, CEO of Dean’s Beans and author of Javatrekker: Dispatches From the World of Fair Trade Coffee , speak tonight at Indiana University. Passionate and positive, he shared his ideas on how socially responsible business practice and respect for quality of life can help change the world. Interesting take. Old business models are often replaced by new thinking. Some organizations transform, but more often they decline and are replaced. A core difference between old and new thinking is the idea of profit maximization and value maximization for shareholders. The difficulty has been and continues to be a question of measurement and recognition. The ability to recognize the value of social responsibility for shareholders is key to the idea’s growth. Efforts to elevate sustainability and Corporate Responsibility are being highlighted publicly by companies in annual reports (See Inditex’s annual report here pg 57), special reports (Apple recently released this supplier responsibility report) and in the media. Right now much of this work is justified to protect corporate reputations (avoiding negative customer reaction), as well as to improve operations (social problems impact supply chains). This transparency helps, but the efforts show differences from Dean’s. Dean says his company takes a three tier approach to meet the corporate responsibilities they have set for themselves. Environmental, Economic, and Social. I had not realized the extent of pesticide use in the coffee industry, second only to cotton, and including multiple chemicals that have been banned for use in the United States. Dean’s Beans helps the co-ops they buy from go through the process of becoming Organically Certified (as he says, ‘organic by design.’) This is more than just ending pesticide use (something he calls ‘organic by neglect’). Dean’s Beans also internally funds what Dean calls People Centered Development. I found the approach interesting: they work with the community itself, they listen and observe, and then help facilitate something the community is going to run. The variety of projects highlights the community specific approach. For example a revolving well fund in Ethiopia called Miriam’s Well, a tree planting project (over 100 thousand trees planted) in Peru, and a prosthetic program in Nicaragua. The goal was to start projects that would self fund over time and last. This approach appears to rely heavily on a very personal relationship between company and community and a belief that the programs must outlast the start-up efforts of Dean’s Beans. So, a great evening even if I was drinking the wrong brand of joe. In the next few days I hope to be enjoying a cup of Uprising!